©1999-2018 F. Dörenberg (N4SPP), unless stated otherwise. All rights reserved worldwide. No part of this publication may be used without permission from the author. 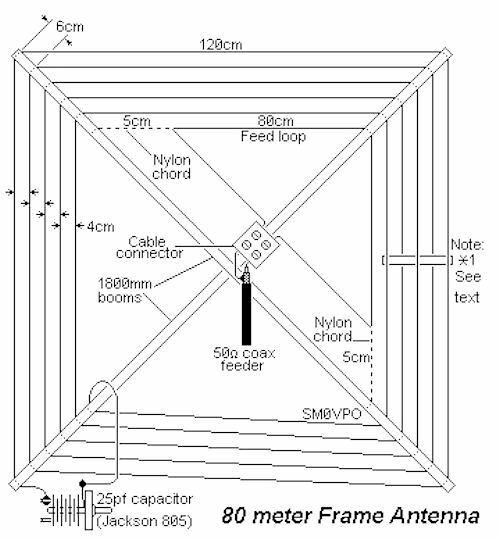 One of my 2008 antenna projects was a square spiral loop antenna for the 80 meter band. 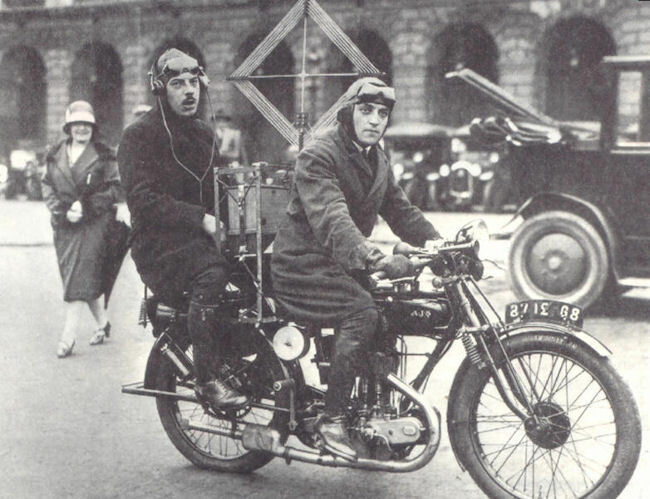 The original design is from Harry Lythall, SM0VPO (ref. 1). So far I had really not been active on 80 meters, due to antenna limitations and its perceived suitability for DX (I am not interested in local rag chewing). So I thought I'd give this one a try. 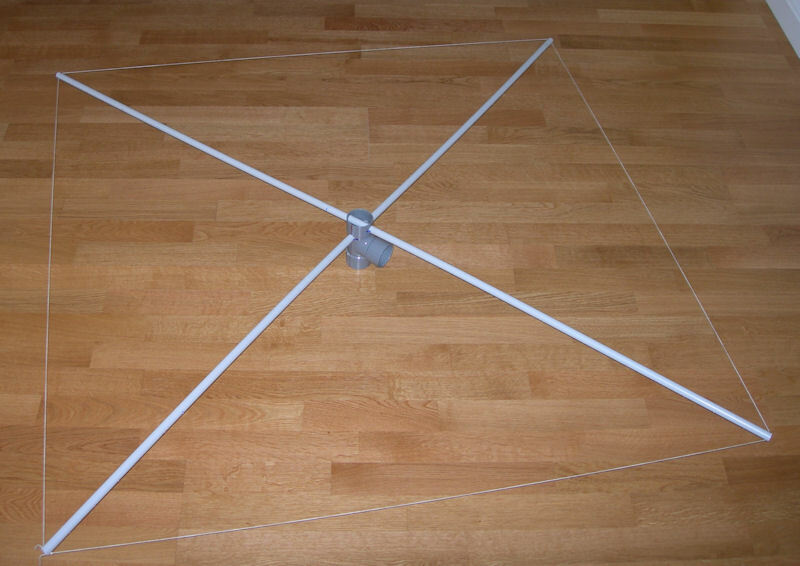 This antenna is very compact: ≈ 120x120 cm (4x4 ft). 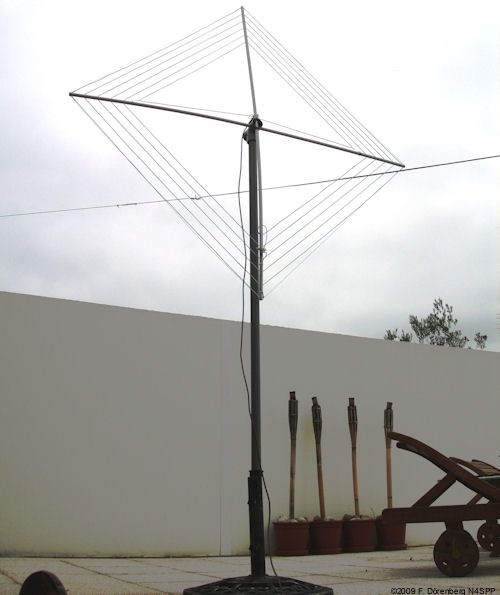 It is basically a transformer loop antenna: it consists of a multi-turn tuned loop and a small feed loop. The tuned loop is spiral-wound and square, has about ¼ λ total wire length. It is terminated with a 25 pF variable capacitor. The small coupling-loop (feed loop) is triangular, with a wire length of about 0.03 λ (≈2m75, ≈ 9 ft). The latter is center-fed and connects directly to 50 Ω coax. 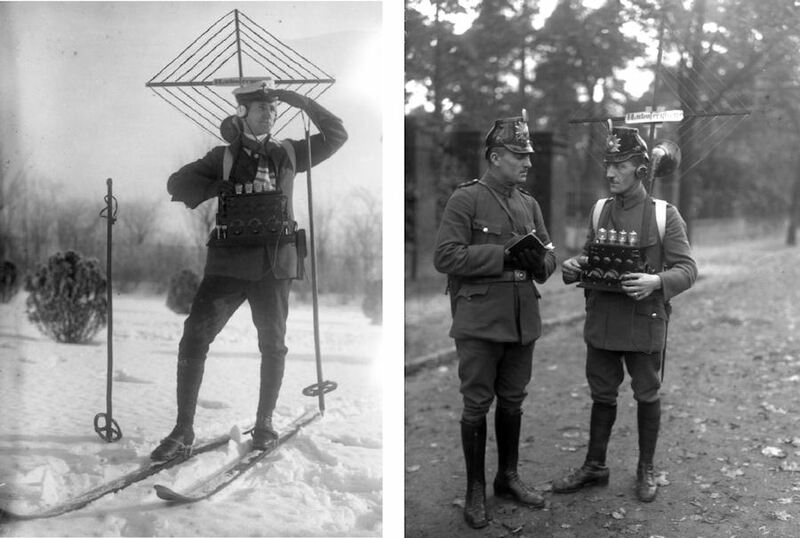 Ski patrol with portable transceiver (1924) and "Schutzpolizei" in Berlin (1932) with receiver EA985 of Radiofrequenz G.m.b.H. 25 meters of 0.75 mm2 insulated wire ("zip wire", AWG 20 or 21, not critical); as suggested by Harry, I split 13 meters of 2x0.75 mm2 household hook-up wire (zip wire), and made a 26 m wire out of it. 25 pF high-voltage variable capacitor (at least several mm separation between the plates). 2-hole household terminal strip (UK: "lustre terminal", "screw terminal"; D: "Lüsterklemme", F: "domino"). BNC or SO-239 coax connector. 2 sections of (at least) 180 cm (6 ft) PVC tubing, at least 16 mm (5/8") diameter, from your local Do It Yourself or building supply store. 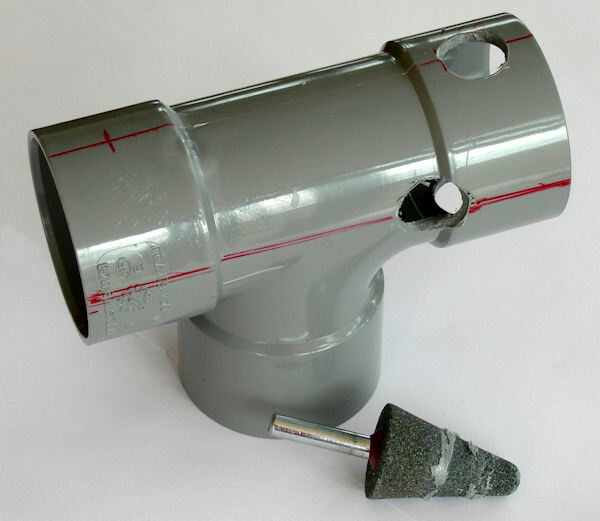 PVC T-piece, for 5 cm (2") diameter PVC pipe. 6 meters of thin mason's string (e.g., 1 mm diameter non-stretch/pre-stretched multi-strand dacron or similar; nylon stretches too much!). A short piece (5 cm) of shrink tube for the antenna wire. Construction is simple. Drill 3 mm holes through the 16 mm pipe, at the distances from the center as marked in the diagram below. At the very tips of the pipe, drill a small hole through the pipe, in a direction perpendicular to the other holes. 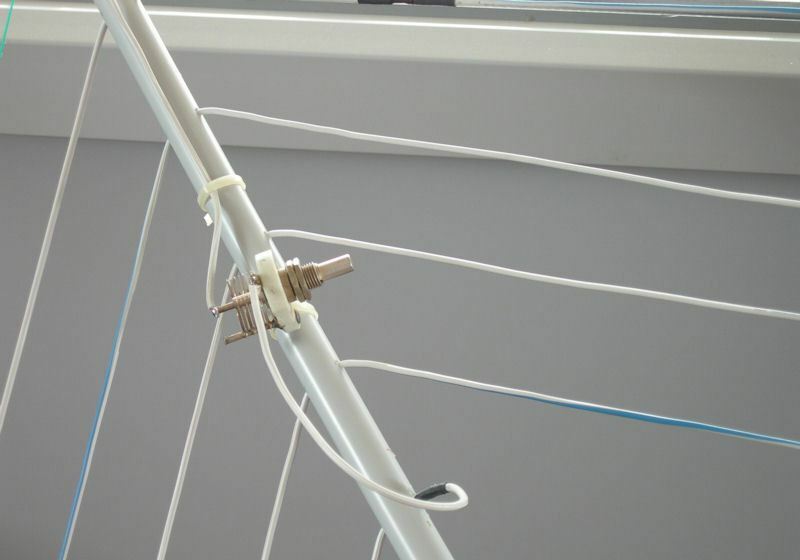 This will be use to connect the tips with a mason's string, to help the pipe "cross" from changing its shape when we install the antenna wire (the tubes are flexible). 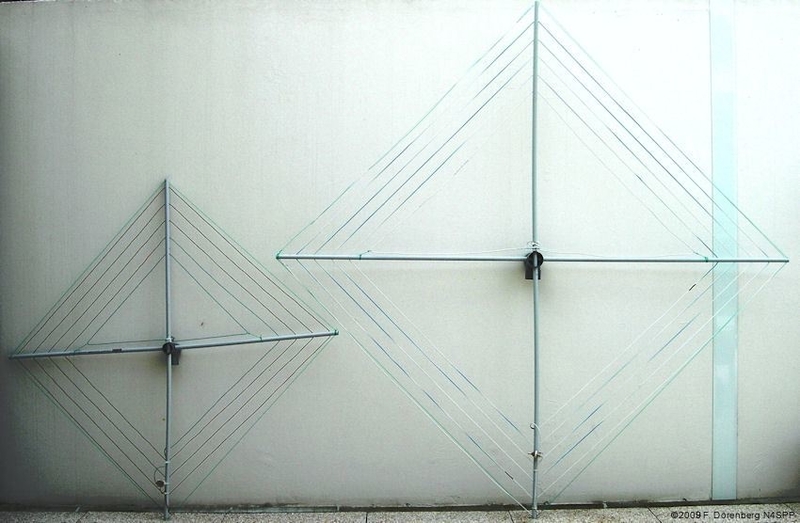 Make a hub for the crossing arms of the antenna structure. I used a PVC T-piece for this, intended for PVC pipe with a 5 cm (2") diameter. All my home-brew antennas are low-weight, and my "mast" is a section of 5 cm pipe. Drill the holes such that it is a tight fit for the 16 mm Ø PVC pipe! I pre-drill with a 15 mm drill (start out with smaller diameter, then increase to 15 mm), and finish with a conical grinding bit. Then slide the PVC tubes through the hub and center them. Turn the pipes such that the drill holes in each pipe face the other pipe. Next, use the mason's string to connect the tips of the pipe - the "arms" of the cross must remain straight, and form a cross, such that the loop is square. This helps a lot when stringing the antenna wire through the arms! Note that if you make the cross brace and hub out of bare wood, the antenna will de-tune when the wood gets moist (dew, rain,...). Tie a knot in the antenna wire, about 25 cm (≈10") from the end. Thread the other end through the outer-most 3 mm hole in one of the arms. From there, thread it through the outer-most hole in the adjacent arm. Put some tension on it (not a lot!). I clamp a hemostat on the wire, right at the "exit" hole. If you don't have one of these medical instruments, you can improvise with small pliers and a heavy rubber band on the handles. Now thread the wire the outer-most hole in the adjacent arm, hold the tension and move the hemostat or pliers to this "exit" hole. Repeat until you have made a 5-turn loop. When you put some tension on the wire, the arms of the cross will bow; this is OK and actually helps maintain tension. Leave about 25 cm wire sticking out of the final hole, and cut off the rest of the wire. Slide the piece of shrink tube over the wire, all the way up against the final "exit" hole (see bottom of photo 5), and - while maintaining tension on the wire - shrink the tube with a hairdryer or soldering iron. 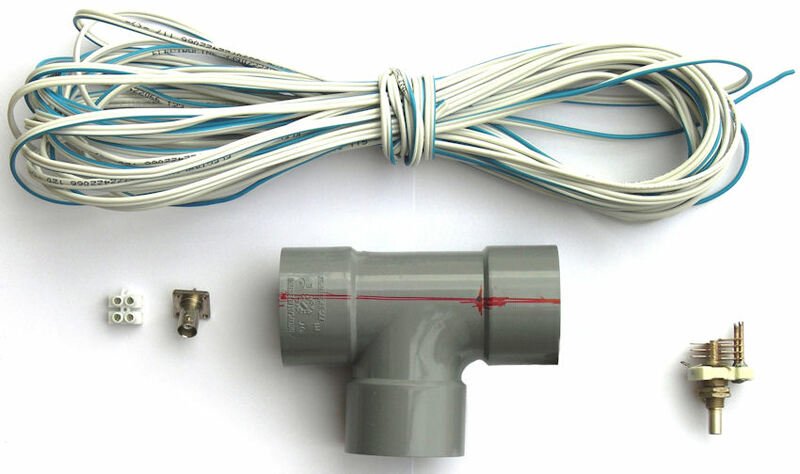 Attach your variable capacitor somewhere on the pipe section that has the start and end of the loop wire. I used a couple of tie-wraps for this. Trim the wire ends to length and connect them to the trimmer. I also fixed the wire ends to the pipe with some tie-wraps. Now install the feed loop. This is a small triangular loop. A right-angled isosceles triangle, to be precise (two equal-length sides and one 90º angle). It has two sides of 80 cm (79 in my case), and a hypotenuse of about 114 cm. So we'll need about 3 meters (10 ft) of antenna wire. We need to make two tie-offs out of mason's string, such that the 45º angles of the feed loop are at a distance of 4 cm from the arms. The tie-offs are tied to the innermost 3 mm hole in the arm (i.e., the one closest to the hub). 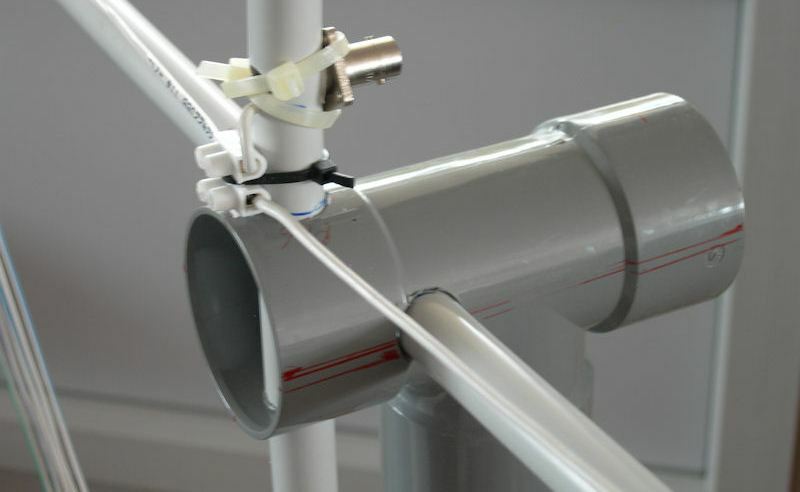 String the antenna wire through the innermost 3 mm hole of the arm that has the start and end of the spiral loop. Position it such equal lengths of wire stick out of the pipe. Thread each wire end through a 5 cm long tie-off, put some tension on them, and lead them to the hub. Mount the terminal block on that same pipe, close to the hub. Cut the wire ends to length, strip off ½ cm of insulation, solder the wire, and mount them in the terminal block. Mount a coax connector just above the terminal block, and wire it to the same terminal block. That's all! Now you can erect the antenna. My antenna weighs 800 grams. When the construction is complete and checked out, I may house the capacitor in a small waterproof box, and weatherize all electrical connections with a good coat of Dip It®/Plasti Dip®. 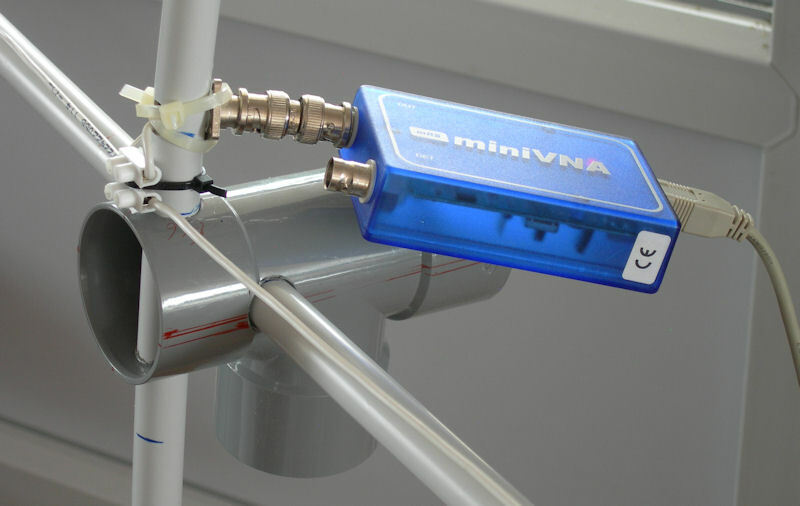 For starters, I hooked up my miniVNA antenna analyzer directly to the coax connector at the antenna. I measured the SWR and R of the antenna, both for the trimmer at its minimum and maximum value. I could easily tune it between 3.64 and 4.3 MHz. See plots below. 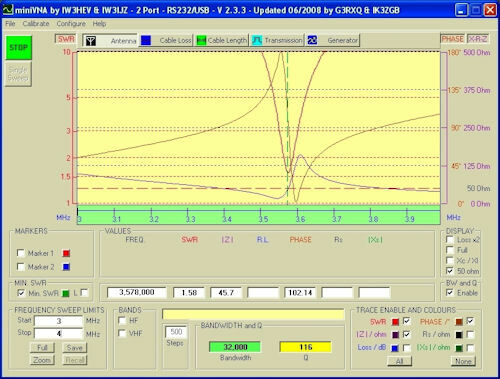 These plots show a very nice resonance dip of the SWR - no tuner required. What more could you ask (other than radiation efficiency)? SWR=2 bandwidth appears to be several 100 kHz. As I am interested in the low end of the 80 meter band (3550 - 3650 kHz), I will need to get a capacitor with a larger max value than the trimmer I used for this experiment. The second set of plots below show a full HF sweep from 1.5 to 30 MHz. With the antenna outdoors, there are additional dips at multiples of the base resonance frequency. As to be expected, they don't coincide with 50 Ω impedance frequencies. Note: I have not done experiments with the spiral installed horizontally instead of vertically, nor have I tried to see if there is any effect (polarization?) when rotating the vertical spiral. 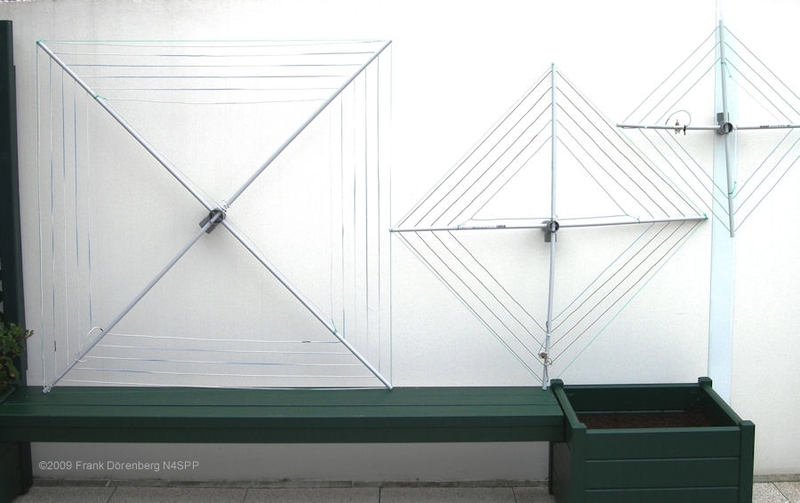 Important: ideally, like dipoles, this type of antenna should be installed at least 0.1 λ above the ground. 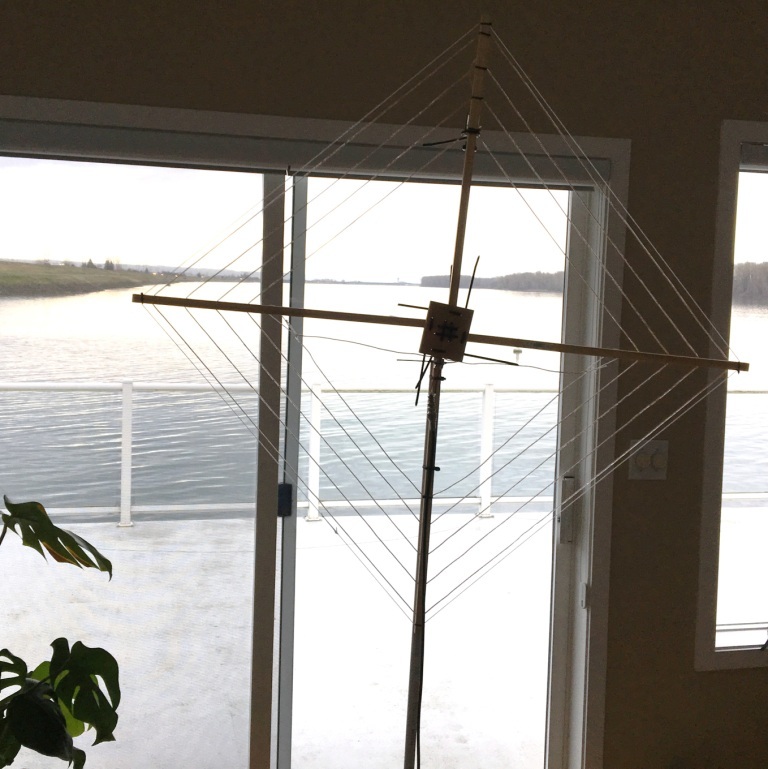 As described above, I built the 80 meters spiral loop antenna designed by Harry, SMØVPO. It is basically a mono-band antenna. 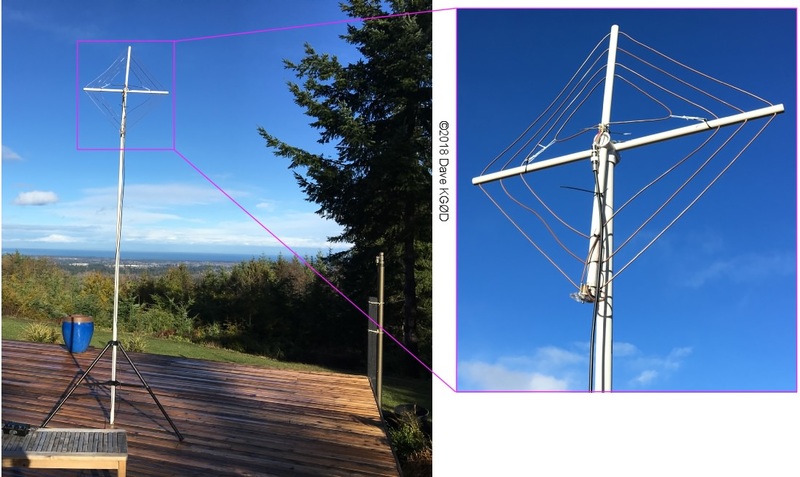 As I am interested in adding a 40 meter antenna to my antenna collection, I decided to adapt the 80 meters spiral loop for operation on 40 meters. That's what I did in August of 2009. 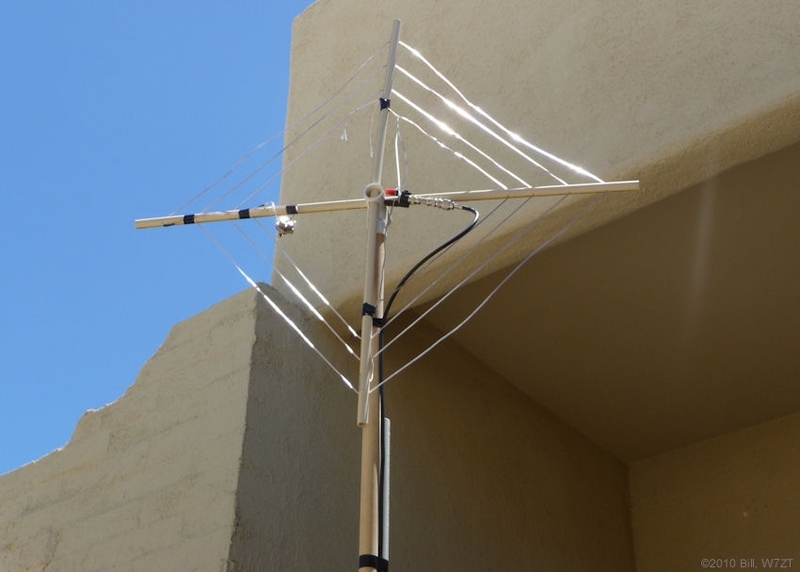 These antennas are easy to make and are inexpensive. I made a quick-and-dirty Excel spreadsheet to play around with the dimensions (ref. 4). In the 80 meters version, the total wire length of the triangular feed-loop is about 0.03 λ. I decided to apply the same ratio for the 40 meter version. I also retained the distance of 5 cm between the innermost spiral winding and the feed-loop, as well as between the spiral loop windings themselves. The total wire length of the spiral loop is about 1/4 λ. Start and end of the spiral must be on the same spreader arm. The spreadsheet showed that this can only be done with a 4-turn spiral, instead of the 5-turn spiral of the 80 meters version. 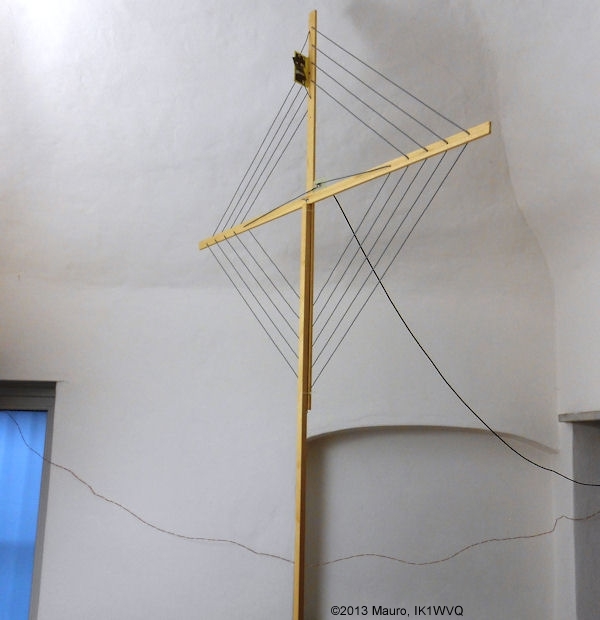 The resulting antenna is not 50% but 33% smaller than the 80 meters version: it measures about 80 cm square, compared to 120 for the 80 meters version. Very compact indeed! It also connects directly to 50 Ω coax, and uses a 25 pF trimmer capacitor for tuning. With 450 grams, it weighs a tad over half of my 80 meters version. 14 meters of 0.75 mm2 insulated wire ("zip wire", AWG 20 or 21, not critical); I split 7 meters of 2x0.75 mm2 household hook-up wire (zip wire), and made a 14 m wire out of it. 15 pF high-voltage variable capacitor (at least several mm separation between the plates). 2-hole household terminal strip (UK: "lustre terminal", "screw terminal"; D: "Lüsterklemme", F: "domino". 2 sections of (at least) 120 cm (4 ft) PVC tubing, at least 16 mm (5/8") diameter, from your local Do It Yourself or building supply store. PVC T-piece, for 5 cm (2") diameter PVC pipe. (I used 5 cm diam. for my 80 meters version but decided to go down one standard size. Works just fine. A standard reduction piece adapts this to my 5 cm diam. 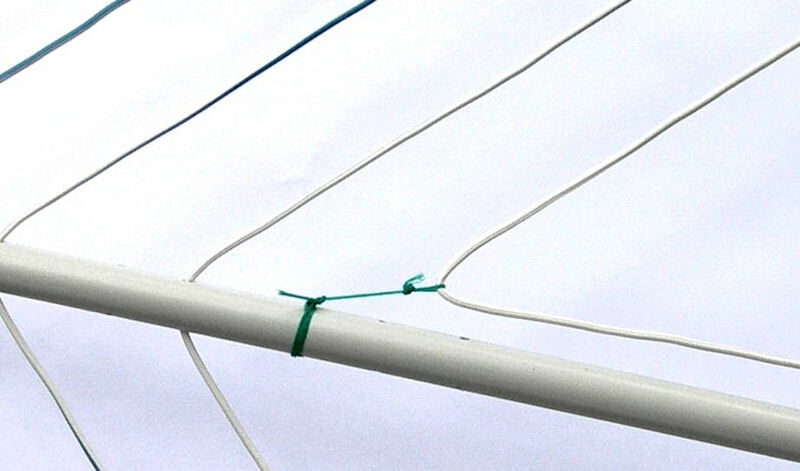 PVC mast). 4 meters of thin mason's string (e.g., 1 mm diameter non-stretch/pre-stretched multi-strand dacron or similar; nylon stretches too much!). The capacitor is home-made. It is a 1-rotor/1-stator butterfly capacitor made of two pieces of circuit board: it works! 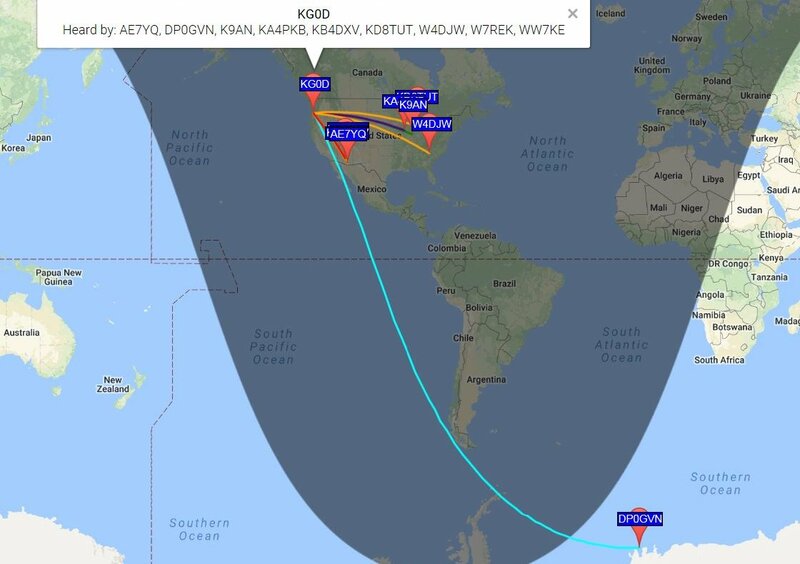 The next plot below shows a 2-hour WSPR spots map with the antenna placed outdoors. Again, with 2 W. The antarctic station is broadside to the antenna and at a distance of 9697 miles (15600 km)! I hooked up my miniVNA antenna analyzer directly to the coax connector at the antenna. I measured the SWR and R of the antenna, both for the trimmer at its minimum and maximum value. I could easily tune it between 6.8 and 8.5 MHz. See plots below. Again, a nice resonance dip of the SWR, I did not need a tuner. I did a very quick "sound check" with my receiver. Received signals were at least as strong as with my short Cobra dipole. I did not turn the antenna to get a feel for its directionality. The trimmer cap that I am using now has 1 mm distance between the plates, so it should be OK for about 1 kV. I have tuned the antenna with 70 watt and there were no signs of arcing. I'm not sure how high I can go without arcing and I don't want to destroy the trimmer. The second set of plots below show a full HF sweep from 3 to 30 MHz. There is an additional resonance dip around 23.5 MHz (3rd harmonic of the base resonance? ), but I did not check where this one goes when changing the setting of the trimmer capacitor). 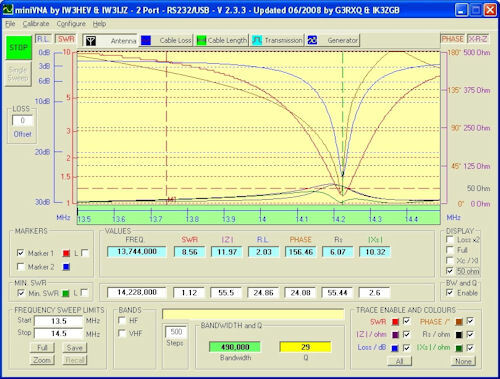 As for my 40 mtr spiral loop, I used my spreadsheet calculator (ref. 4) to find the dimensions of the arms and the placement of the drill holes. Again, retaining the circumference of the triangular feed-loop at about 0.03 λ, I had to reduce the number of loops by one to three (from 5 for the 80 meters, and 4 for the 40 meters version). Again, going to half the wavelength reduced the size of the antenna by 1/3 to 60 cm square (down from 120 cm for the 80 meters, and 80 cm for the 40 meters version). Weight has gone down to 340 grams (from 800 grams for the 80 meters, and 450 grams (1 lb) for the 40 meters version). 7 meters of 0.75 mm2 insulated wire ("zip wire", AWG 20 or 21, not critical); I split 3.5 meters of 2x0.75 mm2 household hook-up wire (zip wire), and made a 7 m wire out of it. 2 sections of (at least) 80 cm (2.6 ft) PVC tubing, at least 16 mm (5/8") diameter, from your local Do It Yourself or building supply store. Construction is simple. It is the same as what I described here for the 80 meters version (with dimensions adapted per the diagram below). 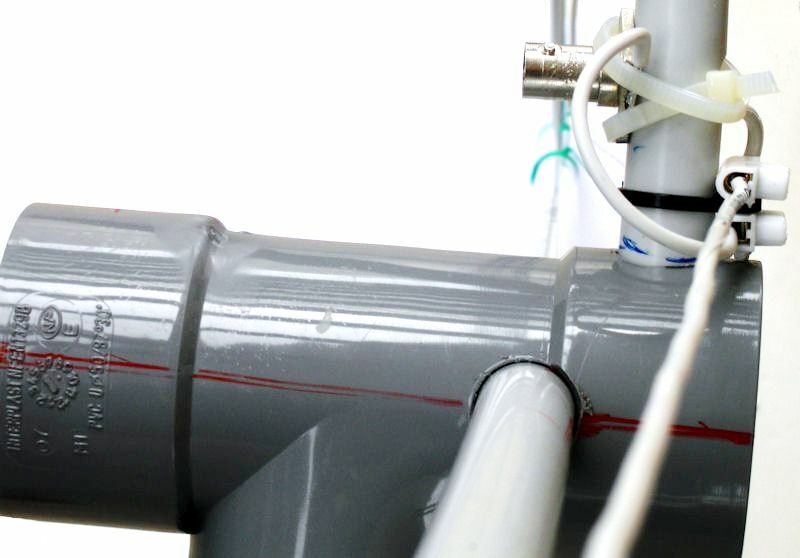 As the PVC tubes are only 80 cm long, they are stiff enough to not need a guy wire strung between the tips of the tubes. Frank: Thanks for info on the Spiral Antenna. Built the 20 meter version today and works wonderfully !! I found a 9-58 [pF capacitor] in the junk box that worked on the top end of 20 meters, but was very narrow banded. I'm looking for an air cap to allow the full band. Did you build a motor drive for the air capacitor ?? If so, can you share details. See attached for my newest fun antenna !! Took the picture before I "cleaned" it up. The BNC to Binding post worked well for input. I get great pleasure in building QRP antennas. Been a Ham for 52 years and having more fun now than ever. Wanted to let you know I built the 20 meter spiral loop for 20 meters. It works well and tuned up as you said it would. Built it per the recipe, but I’ll let you know if I do some experimenting. I’ll hook it up to WSPR next and do some low power testing. What is really interesting is it receives just as well as my 100 foot doublet dipole that is up 75 feet. Nice that it is directional too – several S units stronger off the ends of the loop. Already have the materials to build a 40 meter spiral loop. Will probably do the 80 meter one after that. 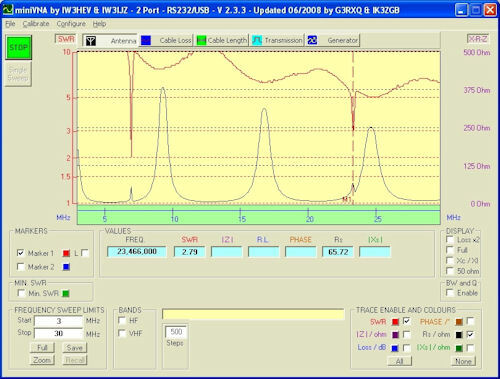 Again, I hooked up my miniVNA antenna analyzer directly to the coax connector at the antenna. I measured the SWR and R of the antenna, both for the trimmer at its minimum and maximum value. I could easily tune it between 12.1 and 16 MHz. 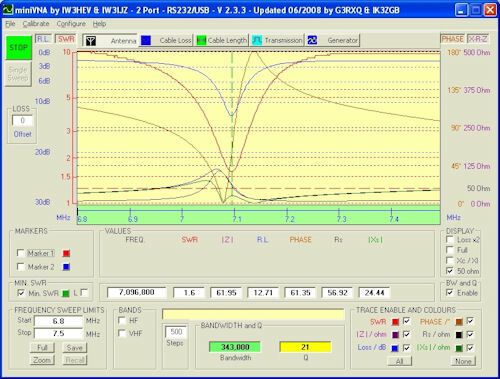 The SWR 1.3 and 1.6 at these extreme frequencies, well outside the 20 mtr band. See the plots below. Again, a very nice resonance dip of the SWR, and an impedance at resonance very close to 50 Ω - no tuner required.